Unfortunately the "Free $10 at shopDisney + Free Shipping Code: DISNEYPAL" offer is no longer available. 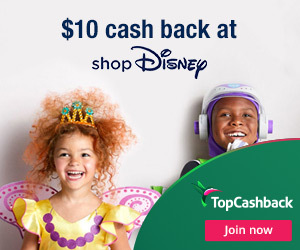 TopCashBack is giving $10 cash back for purchases from the shopDisney website. This fantastic deal only lasts through December 27, 2018. Great items to apply this offer to include Disney Princess Backpack, Incredibles Logo PJ Set, and Ant-Man Action Figure. 1. Visit the offer by following the link. 2. Create your TopCashBack account with an email and password. 3. Click on the "Get Offer" button and it'll take you to ShopDisney. Update: Through November 11, 2018, you can also use code: DISNEYPAL to receive free shipping on your order. They also also running a Friends & Family Sale with items 25% off sitewide.